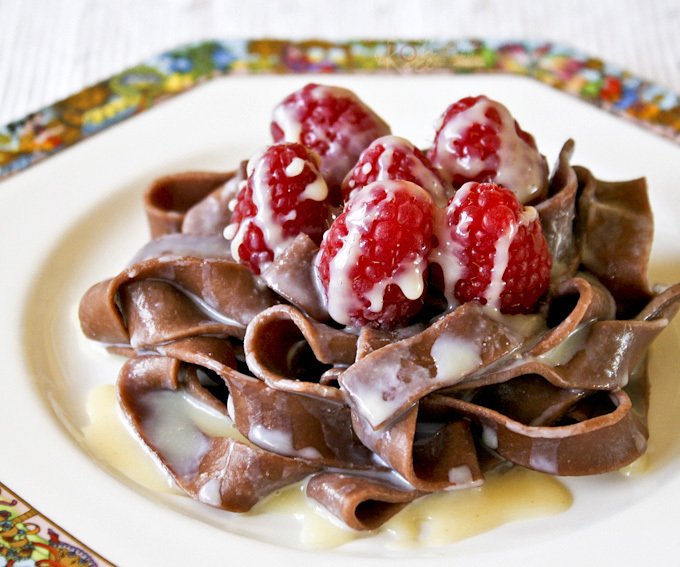 Chocolate Pasta with White Chocolate Liqueur Sauce – a different yet delightfully chocolatey dessert topped with luscious raspberries. Firstly I would like to thank all of you for your concern about my electrical and electronic problems. We had to replace the dish washer as it has outlived its usefulness and was not worth repairing. Ro-Ri San fixed the drain for the washing machine and it’s working fine now. I did have to mop up the spill but it wasn’t too bad. Good thing it did not flood the basement. As for my PC, it is totally out and I am still awaiting those recovery disks in the mail as a last ditch effort to save it. My own set of recovery disks could not wake it up no matter how many times I tried. It was just stressful and sad as that baby is only one and a half years old and I have grown pretty accustomed to it. I am surviving with Ro-Ri San’s netbook and have loaded this little guy with some software so that I can update my blog. It is not like my powerhouse but it will have to do for now. Enough of updates, let’s move on to our Chocolate Pasta with White Chocolate Liqueur Sauce recipe. Recently while browsing at a kitchen store, a package of chocolate pasta caught my eye. This pasta is made in Germany and is specifically for dessert. I couldn’t pass it up. It even came with a recipe on how to prepare it. They suggested stewed fruit and ice cream but I wanted something a little more exciting. It was also an opportunity for me to use some of that white chocolate liqueur that I have thus far used only on ice cream. 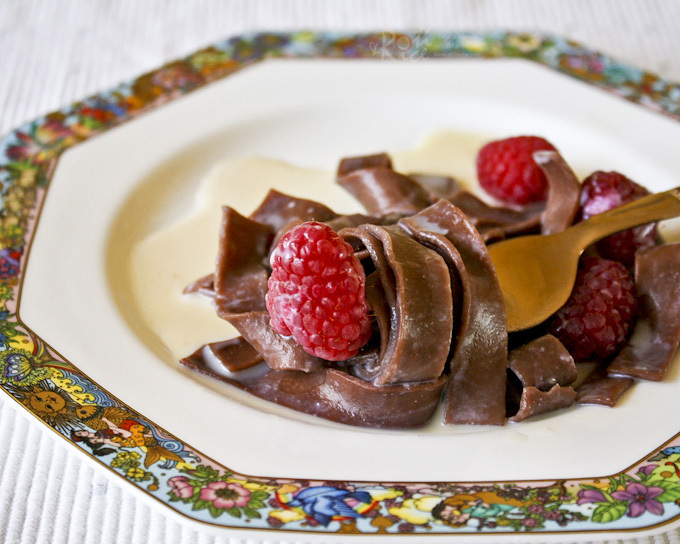 Chocolate Pasta with White Chocolate Liqueur Sauce - a different yet delightfully chocolatey dessert topped with luscious raspberries. Bring 6 cups of water to a boil. Add sugar and pasta and cook for approximately 9 minutes. Remove and drain. Melt white chocolate chips with butter, half and half, and vanilla extract in a double boiler over medium heat. Whisk until chocolate is completely melted. Stir in white chocolate liqueur. Turn off heat and allow sauce to keep warm in double boiler. Place a portion of chocolate pasta on a plate. Top with raspberries and drizzle with chocolate sauce. Serve warm. 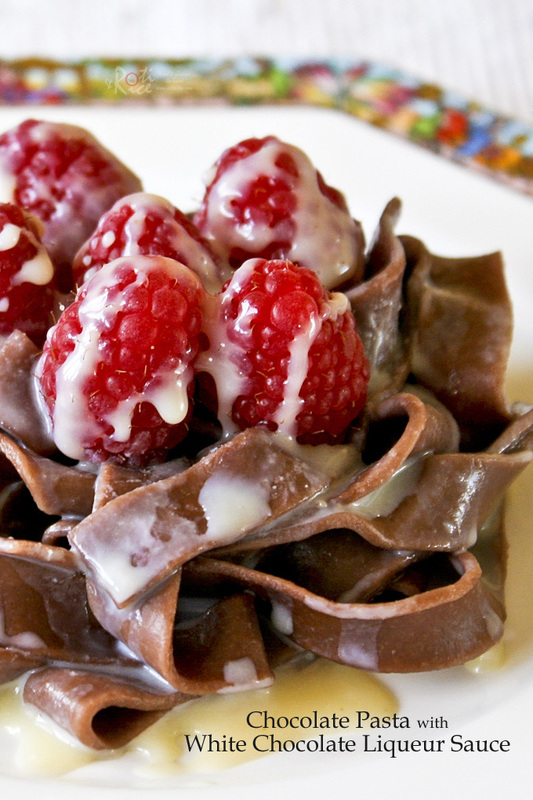 This Chocolate Pasta with White Chocolate Liqueur Sauce is not your usual dessert. It is sweet, chocolatey, and quite tasty eaten in small portions. Do give it a try. Chocolate pasta is not easily available in stores. If you are interested in trying the recipe, you can order a similar chocolate pasta here on Amazon. I make a very tiny commission to help fund the operation of this blog by linking to Amazon.com. I am sharing this dish at Presto Pasta Night #188 hosted by Ruth at Once Upon A Feast. This is my first entry to the event and I am excited to join the line-up. Biren, Never heard of chocolate pasta before. Looks good and those are lovely clicks. Beautiful! I’ve never seen a dessert pasta, very interesting! Good luck with all those technical difficulties! There are few things sadder than having a computer that won’t work 🙁 This pasta looks great, what a treat! That’s true…fewer things are sadder than a cold computer for a food blogger 🙁 Good thing there are such “finds” (chocolate pasta) to cheer me up. Hey Biren! Glad you got everything fixed. I know that kind of thing that is so irritating. You know what?! I’ve never seen chocolate egg pasta. That sounds so good! And I’ve actually never seen a bag of Ghirardelli white chocolate chips either;) I’ll have to look for those, b/c I love real white chocolate. This all looks so good…! Aww i’m sorry about what happened..but glad everything is fixed! Saw this on FB! Thanks so much for the idea! I bought a cocoa pasta from Italy and dont know what to do with it yet. Perfect! Sorry about your washer and computer problems Biren! I love the sound of this chocolate pasta! The sauce sounds just perfect on it. I am going to keep my eye out for the pasta – would love to try it. Computer problems are such a pain. I didn’t know how addicted to the Internet I was until my son broke my laptop last year. Now I always have a mini on spare. I know, I’m pathetic. This looks ridiculously awesome, Biren! I’m a huge white chocolate fan, but white chocolate with chocolate pasta?! Now that’s what I’m talking about! Love the touch with the raspberries, makes the dish irresistible. Oh my god!! This looks amazing. I’ve often thought of a dish like this and what it would be like. Now you’ve shown me. This really makes me want a pasta machine. This is a first for me; I have never seen chocolate pasta before! I love what you did with it. It looks absolutely delicious! I’ll send some “fix it” vibes your way for the computer. Hopefully you can kick it back into submission! This is just magnificent Biren! I love the idea of chocolate pasta, though I’ve never seen or even thought of it! The pairing of white chocolate sauce with raspberries is classic and so beautiful with the pasta. Talk about thinking out of the dessert box 😀 The photos are beautiful but the first photo and the one of the pasta boiling in the pot really caught my eye!! You know, there’s a chocolate pasta recipe in that Hotel Chocolat cookbook I was sent and I’ve been planning to make it when I get my next shipment of chocolate from the company. I’ll just have to pair it with this amazing looking White Chocolate Liqueur Sauce. Wow, that looks fantastic. Thanks for passing it along! Chocolate pasta? wow…that sounds and looks fantastic! A dessert pasta. Looks and sound divine! This is such an ingenious idea. How clever of you! I love it! Wow… that’s pretty neat… I’ve never tried this. Looks great. This looks wonderful, Biren! Chocolate and raspberries are such a yummy pair. I hope you’re able to fix your PC with the disks! What an intriguing and delicious dessert! I love how inventive you were with the white chocolate sauce. Hope your computer gets fixed soon! OMG, this is stunning! I love the combination here. Absolutley delicious. And glad to hear that everything went well back home. Thank you so much for sharing. Hope you’re enjoying your weekend. I love this! I agree with Patty above–this is special. Awesome and delicious! You should enter this in the Presto Pasta Nights roundup. Deliciously new to me and love ur very delicious creativity! Well now that looks alot better than the chocolate pasta dish I made. I’m in the same boat. Hard drive on my laptop died. I’m anxiously waiting for my data to be retreived. Crossing fingers. Wow, this looks great! When I read the title I thought it would be something savoury, but (thankfully) it’s not…I am not that adventurous and still cannot imagine that chocolate could taste good with savoury dishes ;). Wow! A sweet pasta, this looks unique! Looks delicious too. Chocolate pasta? That’s really interesting! Dear Biren – All of a sudden ‘dessert pasta’ is making an appearance on the blogosphere. What fun! Mo just did a recipe too not too long ago. I can’t wait for more of this. Oh Biren, what a cool idea! It sounds like a really fun treat! Biren! You have outdone yourself! This is the most amazing dish I’ve seen you post. Absolutely lovely. First off I am glad you have a temp solution to posting…hope the awaited disks give a permanent solution. Wow! This post sure caught my eye! Chocolate pasta??? Yum! The sauce sounds absolutely incredible and decadent. What a great dish! What a fantastic dish. It’s been quite a while since anyone shared a dessert pasta for Presto Pasta Nights. Thanks for sending this one in. You photos are particularly gorgeous. Well this is certainly something different! Just the thing for a dinner party with a twist. I love seeing recipes like this. I’m intrigued by the chocolate pasta, as any chocolate lover would. 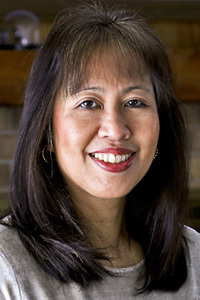 Thank you, Biren!